Rather than the abrupt changes that can occur from an accidental injury to the teeth, the subtle changes that can also occur from various forms of wear and tear can sneak up and cause considerable damage before you or your dentist sounds the alert that something is in fact damaging your teeth. 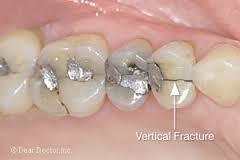 Loss of tooth structure can be caused by: Abrasion, Erosion, Attrition, Abfraction or a combination of these. Abrasion is the loss of tooth structure from mechanical wear due to very abrasive toothpastes or aggressive scrubbing with a toothbrush. 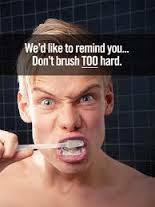 Brushing damage shows up as recession and clefting of the gingiva around the necks of the teeth and the teeth appear to be worn smooth. A high fiber diet can contribute to the problem and even more so the wearing of ball bearing jewelry in the mouth. Significant damage to the edges of the front teeth can be caused by nail biting or using the teeth as a tool to strip wire. 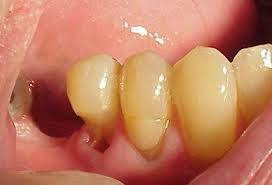 Erosion is the loss of tooth structure due to acidic ph below 5.5. Every time we eat or drink any carbohydrate (starch or sugar) our mouth takes a plunge into the acid abyss. Fortunately saliva comes to the rescue and buffers the acid back above a 5.5 ph after one half hour. In the absence of saliva for people with “dry mouths” decay can run rampant. Acidity in the mouth can be worsened by frequent consumption of food or beverage or treats; this can be made even worse for patients with Gerd or stomach reflux. 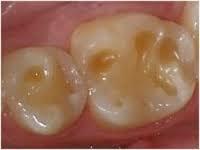 Erosion of the enamel results in a thinning of the front teeth and potholes in the back teeth. Fillings appear to be high or rough in teeth subject to acid erosion. 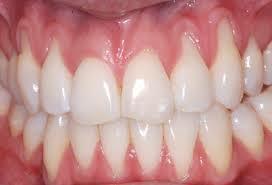 Attrition is the loss of tooth structure where the teeth touch each other from normal or abnormal function. Bruxism can result in the most significant attrition since it usually occurs while we are sleeping; the uncontrolled pressure on the teeth can be nine times stronger than what we usually apply while we’re awake. Bruxism is commonly associated with the occurrence of obstructive sleep apnea in adults and children. Bruxism is also the leading cause of migraine headaches which develop in the morning. Bruxism can lead to individual tooth mobility and/or pain as well as TMD syndrome effecting the masticatory muscles and jaw joints (TMJ). Non painful signs of Attrition include the shortening of the front teeth to the point where yellowish/brown dentin unde r the worn enamel can be seen and all the teeth become flat after losing their anatomic curves and inclines. Abfraction is the loss of tooth structure caused by excessive pressure on the teeth that results in tooth loss or damage not in an area where teeth actually function or rub against each other. Bruxism or hyper functioning of the teeth can result in loss of tooth structure on the sides of the teeth near the gum tissue where the zone of tooth flexure or bending occurs. The other type of damage that can occur is the formation of a craze line that progresses to a crack and ultimately can result in the tooth fracturing. The most common cause of tooth fracture is an old amalgam that is leaking and developing recurrent decay in the tooth which will swell like a cork in a bottle and eventually split the tooth. Many of the answers to your questions already exist in archived articles in this blog which you are welcome to explore. 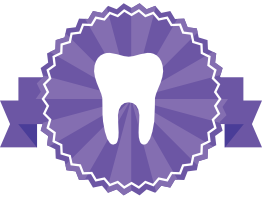 The most important step for you to take is to have a complete evaluation/exam by a dentist thoroughly knowledgeable on these subjects. There are many simple preventive steps that can be taken and if the need arises, the miracles of modern dentistry will help you find a solution. Snoring/Sleep Apnea Alert: Stop Snoring Before It Stops You! Snoring can kill you. The struggle for breath can result in soaring blood pressure that can cause heart disease, stroke and kidney failure. 30% of the population under 40 snores, while 50% over the age of 60 does. Sleep Apnea is the direct cause of over 40,000 cardiovascular deaths per year. So while snoring can be annoying to the significant other, it can be deadly to the person doing the snoring. If you snore and have obvious signs of sleep deprivation such as morning headaches, feeling sleepy during the day and your snoring is very irregular, you are well advised to get a professional opinion. Usually the first step is to be screened by your physician or dentist who will determine whether you should be referred to a sleep diagnosis center. The sleep center will be able to determine the level of severity of your sleep apnea and recommend an appropriate range of treatment options. For treatment of low to moderate levels of sleep apnea, I have found the “silent nite” appliance to be the most comfortable and effective. This has been confirmed on many of our patients who have obtained very good results using the “silent nite” during follow up sleep center studies. Please don’t risk your health on magic drops or low budget self fitted appliances. Just like parachutes and life preservers, a properly chosen and fitted appliance based on thorough diagnosis is where you want the best available.